Maspalomas is home to one of the first gay pride celebrations of the European season kicking off in May each year. Maspalomas Gay Pride 2017 is scheduled from May 4th to 14th and it’s expected to be bigger and better than ever. The event includes a giant street parade in Playa del Ingles, as well as a variety of performances by international artists, dance and pool parties and boat trips. The recent addition of Circuit Festival Maspalomas adds an additional reason to head out to this gay friendly island off the coast of Africa for an extended few days of relaxation, parties and fun. The city is incredibly gay friendly, so much so that a recent straight couple complained on TripAdvisor that he and his girlfriend felt outnumbered. We think that’s a pretty good review! You’ll find it easy to meet people throughout the event because the city sees a huge influx of tourists for the celebration. The warm, temperate weather makes it a particularly inviting destination for those looking to enjoy some sun in the spring, when most European destinations are just starting to warm up. 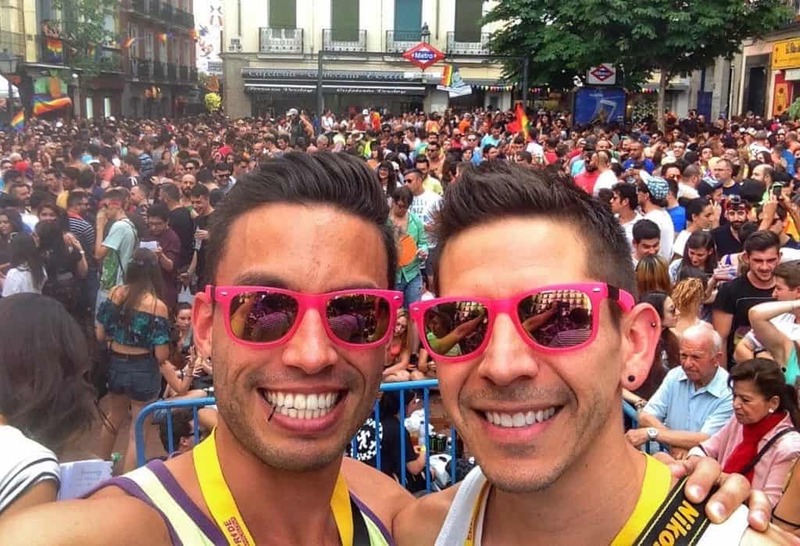 Spain’s capital city hosts the largest gay pride event in Europe each year. In 2017, the city has the honor of hosting Madrid World Pride, which is scheduled from June 23rd to July 2nd and is not to be missed! The schedule starts earlier in the week than normal for Madrid Pride, but most events are still taking place from Wednesday to Saturday. There will be a variety of outdoor concerts throughout the event along with other celebrations of art, culture, sports and more. As with every year, one of most popular events (besides the parade of course!) is the crowing of Mr. Gay Spain, where handsome young candidates from all over the country compete. The occasion is particularly special as it commemorates the 40th anniversary of the first pride march in Spain back in 1977. 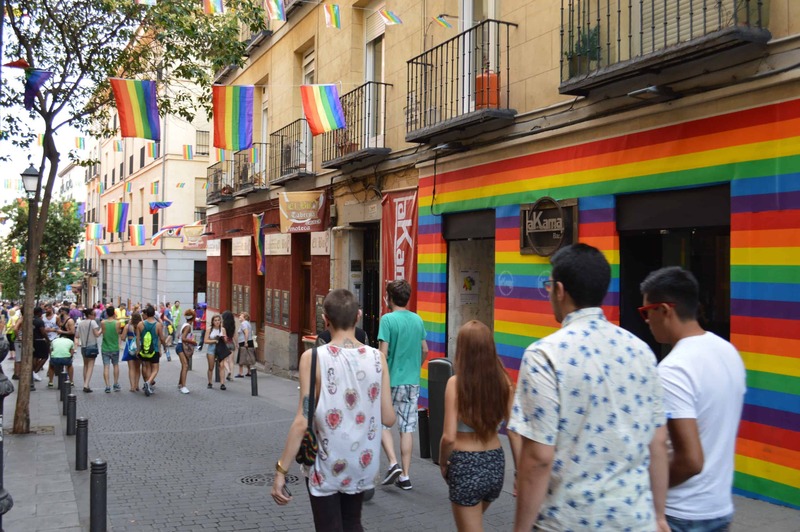 Madrid is well known for being an incredibly open and LGBT diversity city. In fact, one thing we love best about the event is that it’s not just the gays that come to celebrate, but the entire city. World Pride 2017 is going to draw the biggest town out yet with an expected 3 million people flooding the streets of Madrid for this week long event. Sitges is one of the smaller cities on the list, but that doesn’t stop it from being a top destination for a gay pride celebration. In fact, this cute and quaint Catalan village just south of Barcelona is one of our favorite places to visit. Sitges Gay Pride 2017 will run from June 8th through 12 and features outdoor concerts, parties, lots of performances and shows and an energetic parade that takes place right on the boardwalk, just steps from the beach. Sitges has been a LGBT hotspot for decades and it’s especially popular for gays during the summer months of June, July and August. While the city does have museums and other cultural points of interest, the main attraction is the beach, the restaurant scene and the amazing nightlife. If you are looking for a fun event combined with a small town vibe, Sitges should absolutely be on your list of destinations. Barcelona has been a destination of choice for gay tourist for the past couple decades and its reputation as a gay friendly city is well deserved. The Mediterranean climate is difficult to pass up and the proximity to beaches and mountains make it a visual masterpiece. The Catalan Art Nouveau architecture is one-of-a-kind and is one of the most important cultural elements of the city. 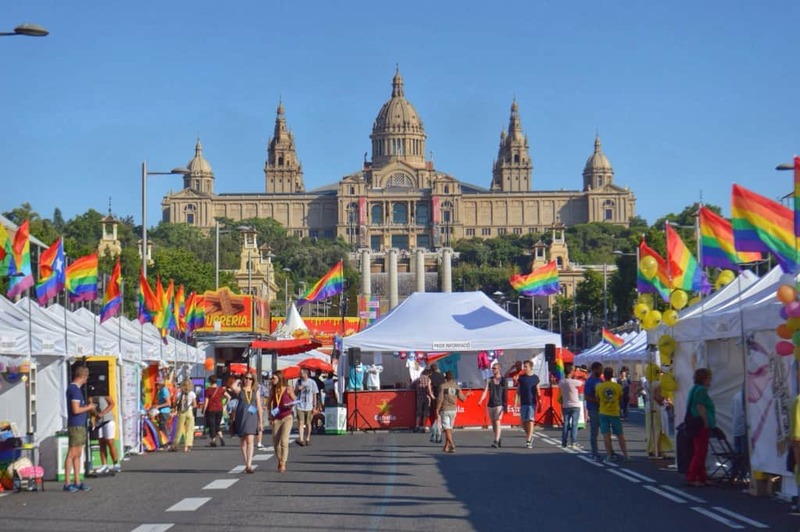 Pride Barcelona 2017 is scheduled for July 7th and 8th and features a dedicated pride village with food and drink vendors plus lots of activities and performances throughout the weekend. The city hosts numerous parties and activities including an amazing (and free!) outdoor foam party as part of the festivities. Special Offer – Interested in visiting Barcelona during Pride? You can save 50€ on the Barcelona Gay Pride package with our friends at Rainbow Gay Tours from July 5th – 10th. Just mention the promo code “TWOBADTOURISTS” when booking for your discount. More info here! Ibiza Gay Pride took a short hiatus until its return in 2015. After the success of the last two events, the annual parade will return in the summer of 2017. The pride parade is small compared to most on this list but the outdoor concerts, cultural events and activities plus the lineup of day and night parties make up for this newbie gay pride player. The event is expected to take place in June 2017. 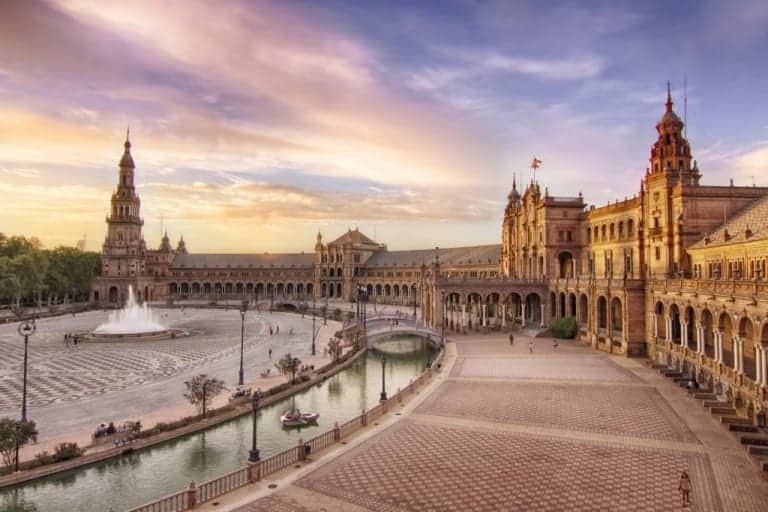 Seville is located in southern Spain and is the capital of Andalusia, famous for flamenco, great food and vibrant, Spanish culture. With year around warm weather and architectural wonders, it’s a must-see destination for any visitor. The gay pride celebration in Seville (technically the pride of all of Andalusia) is scheduled for the last weekend in June, and although it’s a relatively small event compared to the other major Spanish cities, there is still widespread community support and it’s a great alternative pride where the local scene is very much alive. Unlike the larger celebrations, Andalusia pride is officially a one-day event but you’ll still see an influx of visitors during the weekend from across the region. Benidorm hosts one of the last European gay pride events for the year held at the beginning of September. In 2017, the celebration is scheduled from September 4th to 10th and it marks the 7th anniversary of the event. The local turnout shows how supportive the area is of its residents and a large number of tourist make the journey to enjoy the festivities. There are a variety of outdoor performances and parties including an amazing outdoor White Party, which takes place at Benidorm’s most famous lookout point (Mirador del Castillo), proving amazing views of the city by night. The weather in Benidorm can’t be beat and it’s a great way to end out your summer. Which gay pride would you most like to attend and why? Let us know in the comments below!